At the Travel Hall we join another crowd, once again pushing and shoving to get through the narrow doorway. We manage to get to the middle of the crowd and are funneled into the hall. The cavernous hall is packed. We drop our bags against a wall. Hanaa* goes to buy something to drink; I push my way through the crowd to the counter to try and get the man behind the glass to take our passports. He finally takes them, gives them a quick glance, and throws them back at me. Our exit papers don’t have the proper stamps. We need to go to a different counter and then return. After getting the stamps affixed to the exit paper, I shove my way forward yet again and get the passports into the hands of the agent. He puts them in a stack of dozens and hands them to another man who takes them into a nearby office. We slump to the floor as near to the counter as we can get. It is 2:30 pm. We spend the next three hours waiting, listening through the din of the crowd for our names to be called. There is no intercom system, no monitors to show your name, just people shouting out names. Hanaa is exhausted, shaking, and barely able to move. We share a small bottle of water and a soda. At 5:30 the man next to us explains he has been waiting since noon. We entered the hall almost 2 hours after he did. Apparently there are issues with the computer systems and the phone lines to Cairo. This is the same excuse that was given to me in 2011 as I waited 6 hours at the gate before I was allowed to proceed. The snack bar runs out of water, soda, tea, and coffee. There is no food except crackers and candy. The trash receptacles are full and overflowing. People throw their trash on the floor. The two bathrooms, each with only four stalls, are filthy. The air is stagnant and hot. The hall is full; all the chairs are taken. 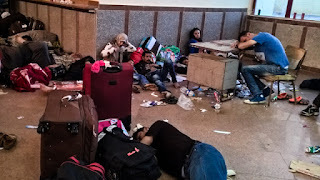 The aisles are blocked by people sitting on the floor and the piles of luggage. People are exhausted. Old women slump to the floor crying. Three men are stamping the passports that come back from the Mukhabarat (Egypt’s Intelligence Service). A thousand or more people are waiting. After stamping the passport, the agent shouts out the person’s name and waits for them to fight through the crowd to the counter. People begin raising their hands and the men just fling the passports into the crowd. I walk around a corner, down the main hallway to a guarded door that leads to the back offices. I’m told to go away, to wait out front with everyone else. Old women, people in wheelchairs, young moms with kids in tow were all pleading for something to be done. For hours I would walk back and forth from the counter to the hallway asking for help, for some consideration. None was forthcoming. 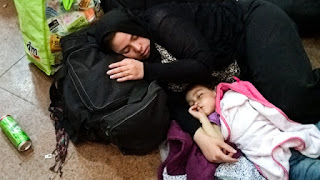 I can’t forget the old man, a double amputee, in a spotless white thawb laying on a small piece of cardboard on the floor next to his wheelchair; the exhausted sweaty children, sleeping in the aisles of the main room as people climbed over them; the old woman, who had been sobbing earlier, spent and now quiet, laying on the floor next to me and Hanaa, resting her head on a small bundle. The exhaustion and frustration etched on people’s faces is still difficult to bear. This system has been in place for years. Nothing is ever improved; even the simplest fixes are not implemented. This is exactly how it is designed to work. Every aspect of the system acts as a deterrent, so people will no longer try to travel. 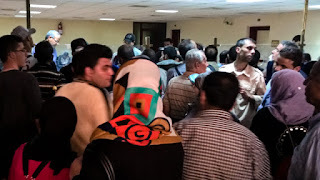 If you were to find yourself in this hall, desperately trying to get home, and were met with the complete indifference, contempt, and bald-faced lies of the authorities in these rooms, you would not accept it. But thousands of people have no choice. If you cause too much of a problem, you risk getting thrown out, ending a bid to see your family, or return to your home. The authorities told us, “Go away, go sit down until your name is called,” and we sat. They told us to “Wait right there for 5 minutes,” we waited for an hour. People had to endure it, much like the siege itself, like the lack of medicine, like the lack of jobs, like the lack of homes, like the lack of possibility, like the lack of a future. One indignity piled on top of another. When you think it can’t get any worse, it invariably does. Yet the people remain. They struggle. They persevere. Against desperate odds, they survive. That being said, every time people are treated with such disregard something of our humanity is lost, and all of us suffer. There is an announcement that the exit doors are also closed. A commotion ensues as people are still trying to leave. Now Hanaa would be forced to stay the night. 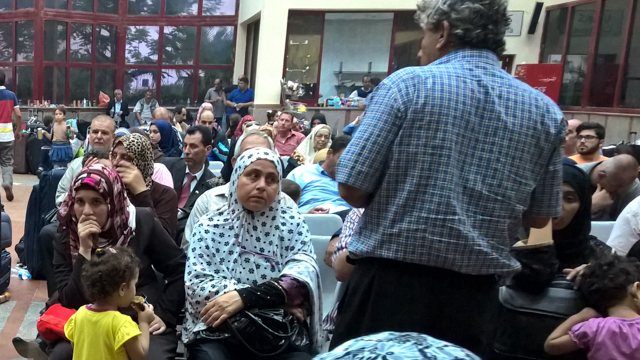 In the hall I recognize an Egyptian man who I dealt with in previous trips to Gaza. I implore him to find out what is going on. He promises me he will, “Wait here for 15 minutes.” An hour later I found him smoking a cigarette and laughing with a friend. I call to him. “Fifteen minutes,” he assures me, without getting up. 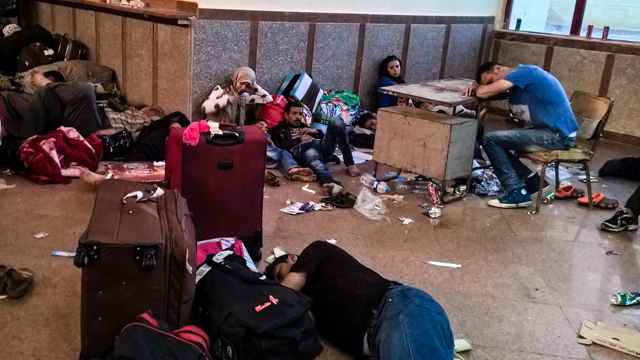 Hundreds of people are lying on the floor amidst the garbage and their luggage. The Egyptians provide nothing. There are no blankets, nothing to lie on, the snack bar is closed, no food is forthcoming. And here I am hoping something could be done for me, amongst all these stranded, desperate people trying to go home. I run out of words and feel deeply ashamed. Hanaa finds a darkened corner where we can lie down. I take a minute to look at all the people around me. I try to make sense of all that has transpired, but can only shake my head. Even as I write this I cannot comprehend it. Hanaa was next to me on a thin piece of cardboard. She covered her face completely. The mosquitos were out in force. Although I am lying on just a towel on the marble floor, I quickly fall asleep. At 6 am I wake up and look around me. People are already stirring. I walk around the hall, it is finally quiet. People whisper to each other. The energy level is low. I step outside into the bright sun. Small groups of people are talking and smoking. A football appears and the youth begin kicking it around. No one smiles. Hanaa joins me and we go back outside to get some fresh air and consider our options. A young man we met near the passport counter comes and sits with us. He says he knows someone working with the Mukhabarat and he will make a call. Hanaa goes with him. They also come back quickly. There is no way I will be allowed to pass. It is not Egyptian policy, but American policy. U.S. Citizens are no longer permitted to enter Gaza through Rafah Crossing because the U.S. Embassy in Cairo will not permit it, there is nothing to be done. Hanaa lights a cigarette. A young man approaches us. I ask him what he was doing outside Palestine, “Were you working? Going to University?” “No,” he replies, “My brother has kidney disease. 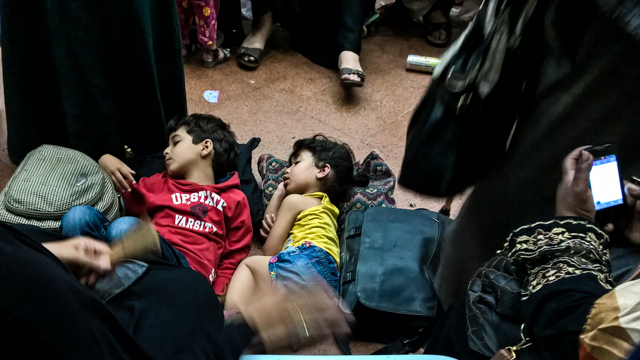 I went outside Gaza so I could donate my kidney to my brother, now I am trying to return home.” Luckily, his brother had been called the day before; he made it back to the family in Gaza before the terminal closed. I encourage Hanaa that it was time she went to her family. I would wait for my passport and return to Cairo. She reluctantly agrees. We gather her bags and I walk her to the doorway that opens to the Gaza side of the crossing. She steps outside without looking back. At 1:30 pm my passport is returned. There are still hundreds of people in the hall waiting to be processed. I grab my bags and I am escorted from the Travel Hall back to the gate that I forced myself through 24 hours earlier. People dragging their luggage walk quickly past me toward the Travel Hall, relieved to be inside the crossing. At the gate, the scenes from yesterday repeat themselves. A man tells me that they just began allowing people to pass. The numbers of people are much lower, maybe only one hundred or so. The soldiers must have turned cars back in the morning. I shove my way past the soldiers and the people jockeying to enter. I feel free but utterly, completely defeated. I walk past the APV to the few remaining cars, hoping to find a ride across the Sinai and back to Cairo.